Many of you who live close know that I sold my place last July in 2017. This was extremely difficult decision for me that has been difficult to write about. My place in the woods will hold a special place in my heart always as I spend most of my 65 years up there on and off. The most significant being living there from 2002 to 2015 full time. The beauty and the struggle of living full time remotely became must more difficult for me after my accident in 2008 and I had to find other work that was less physical to finish my working years.I completed this video in remembrance of the place I loved. I now retired as of April 2nd. 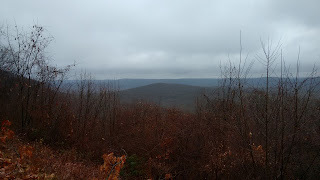 My love of the woods has moved me to a new adventure and I will be hiking the Appalachian Trail starting April 21st, 2018 at Front Royal, Virginia and going north to Maine, then coming back to Front Royal and going South. I am taking this strategy due to over crowding on the trail, which I hope to avoid and be able to enjoy nature more. For those of you who care to watch my adventure I will be posting it to YouTube on my Channel Windeagle Martin as much as possible. I miss Leetonia and will always have it in my heart. 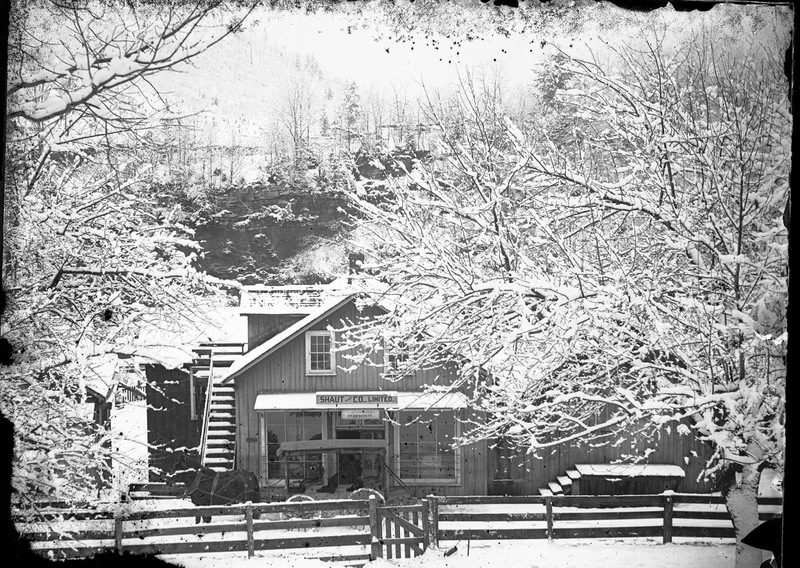 This is a picture of the general store in Leetonia at the turn of the century. This could be today in Leetonia with snow freshly on the trees. 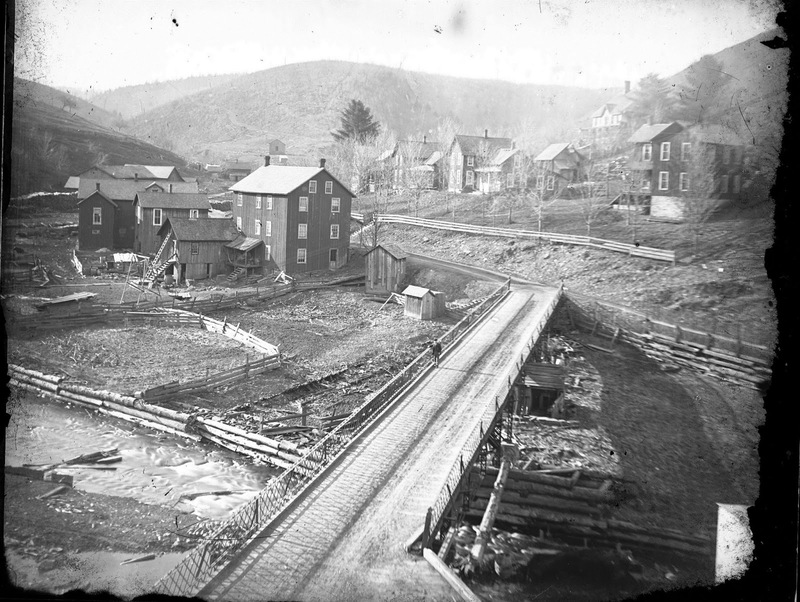 This is where everyone in Leetonia got paid, and bought their goods for the week. I think it was pretty much and even trade with not much left over as the town was a company town and so was the store. People worked to make a bare existence living. They worked long, dangerous jobs in the Tannery, saw mill and in the woods lumbering. 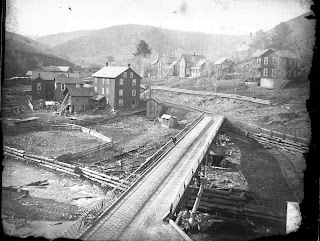 The Tannery and Saw Mill are gone along with the rail road that carried the goods out to the world. The lumberman still log these woods and it is a dangerous job in which lives are lost every year. Other than the loggers no one is making a living in Leetonia anymore. 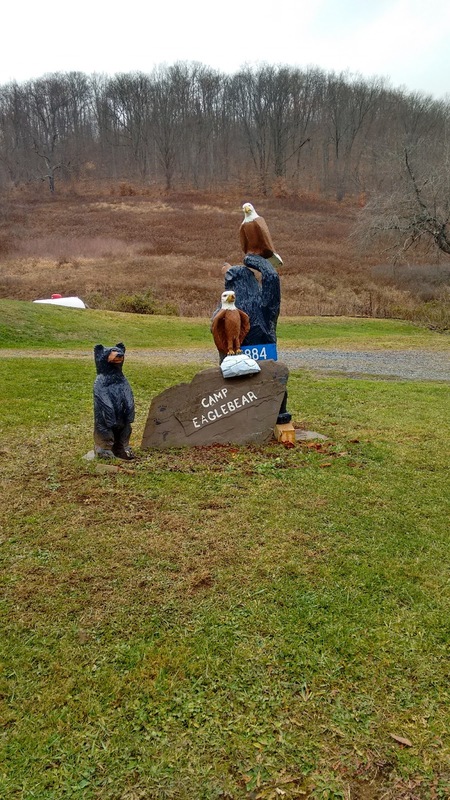 Instead the woods are filled with snowmobilers in the winter, hunting, fishing, and recreational camp users in the summer. 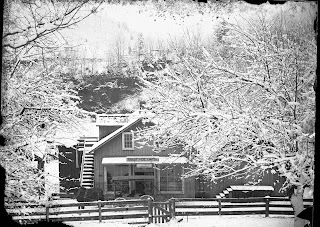 When I am in Leetonia, I love to listen and sometimes I think I hear the sound of the railroad, smell the tannery and hear the stories being told by the old timers sitting on the store porch. Mountain girl, Paula, logging out. Although winter does not officially begin until December 21st, snow has fallen in Tioga Forest and has decorated the forest with a nice white gown. It is interesting how every year the first significant snow fall is always so pretty. By the end of February, the comments about snow will turn to dismay as people will start being tired of the white somewhat colorless winter and start wishing for the end of the winter white. Last year we seemed to skip winter and not much snowmobiling or other winter sports were possible. This could be why last night I saw a snowmobile running across Ridge Rd on the tiny 2 to 3 inches of snow we have gotten. 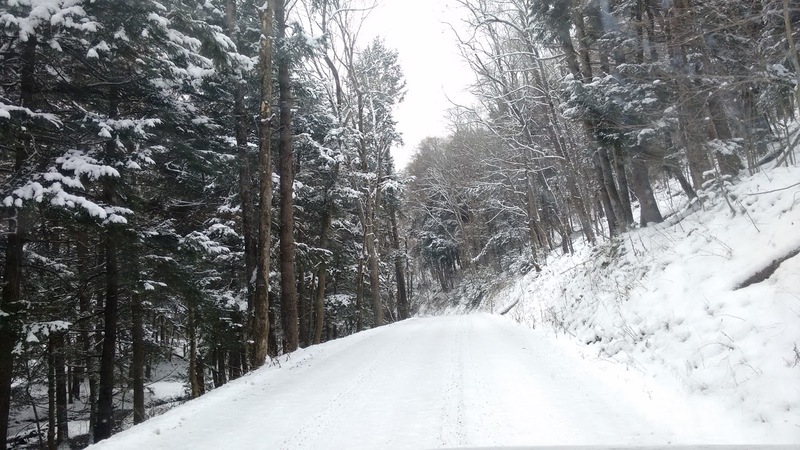 One good bit of news for those of you who like to visit Leetonia in a car, the township is plowing the road from Parker Hollow to just past the Pioneer Camp. For some reason they decided to turn around at Melvin's driveway and not do the last 300 yds to Painter Leetonia Rd. They are doing this because of someone living full time across from Mick's old place. This is good news for me as it means I can get up and do some skiing or hiking this winter. This coming week has promised to start giving us some of the cold temperatures we usually get earlier. By the middle of the week we will see single digits. So if you go out dress warm. I never like leaving my home in the woods even though I live a short distance away my city home lacks the quiet and solitude of the woods. This time as I was leaving I noticed a UPS sticker on my old UPS collection box I built at Parker Hollow. UPS will not deliver back in the woods. At first I thought someone used my old address and I might find frozen fruit. But when I looked inside it was a flat envelope addressed to 5990 Leetonia Rd., This is a camp as you head South on Leetonia Rd is right before you get to the pipeline on the left. I am not sure who owns this camp, but no one is there right now. If you know tell them their envelope is in the big green box at Parker Hollow. Mountain girl, Paula, back to work and missing Leetonia. Got up here Wednesday evening for a nice long weekend in my favorite place. A couple weeks ago, I found my large carved bear laying on the ground. In the past bears have knocked over the small one so I figured one gave the big one a push. When we went to lift him back up the base he was sitting on broke. I had to chain saw it off making him about a foot shorter and put a board into his back to keep him upright. It looks like this will be his last winter and I will need to carve a new one in the Spring. The new one won't be as big. 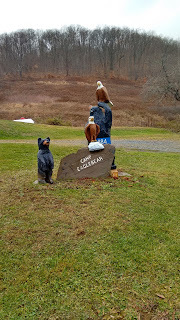 The eagle on my rock also suffered a blow to the face and is missing part of his beak. Not a good year for my carvings. I decided to put in a ceramic floor in my downstairs bath as I really liked the one I did upstairs a number of years ago and the vinyl was worn out. So my big project was taking everything out and doing the floor. I am going to wait until next week to put everything back on it and give it a week to cure. Of course now that I did it the wall don't look so good so now I will have to paint them. I bit of reverse order from the way I like to do it, but it shouldn't be bad with everything out. Saturday I took a bit of a break and hiked up to Cushman view a little over 3 miles from the house. I said, hi, to Mick who has his permanent view up there. I have to say he chose a good spot. For those of you who don't know Mick, he was a long-time resident of Leetonia and a true mountain man. I heard via Facebook that a lot of people got bears this year. John Schilken from the Tannery got his first. So far I haven't heard anyone say they got Snaggle Nose, but it will be Spring before we know if he escaped another season. The weather has been unseasonably warm and the small amount of snow we had earlier is gone. Deer season starts soon and then the long cold winter will really begin. I for one am enjoying the mild days while I can. Mountain girl, Paula, logging out. Yes, Snaggle Nose followers he is still ticking after all these years. 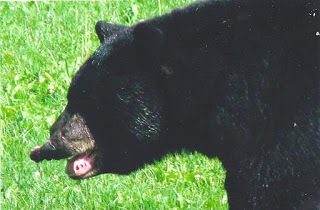 The first I heard of Snaggle nose was the summer of 2009 when my neighbor called me stressed about an adult male bear who had part of his face hanging and bloody from a fight with another bear. This bear had to be at least 3 and probably 4 by that time. He is close to 11 years old now and is a force to be reckoned with. 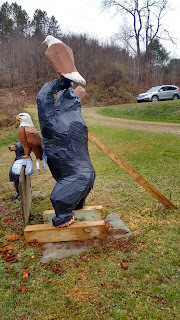 The other bears run when they see him and he doesn't hesitate during the summer non-hunting season to stroll around Leetonia in the middle of the day and take any food he can find. His size is at least 600lbs and he sports a permanent growling appearance, which is not as noticeable in the top picture. John said, Snaggle Nose came up behind him while he worked on the door of his place. I am sure he quickly stepped inside the camp. John said, "Snaggle nose was smelling the back of Pats truck when I yelled at him. All he did was turn to get his picture taken. Walked on back side of truck and up the drive." Pat had left some feed in the back of his car and Snaggle nose would have been happy to relieve him of that burden. This bear teaches me a lot of what it means to be gravely injured, heal and not only survive but thrive. If any of us had gone through what he has..would we have given up, hidden somewhere embarrassed by our deformity? Would we have held so much trauma in our brains that we never again became a functioning member of this earth. Snaggle Nose didn't give it a thought. He healed, he grew, and he became the biggest bear in all of Leetonia. He is a force to be reckoned with and honored. We should all have the heart of this bear and not retreat from life, but face it with whatever face or body we have been given. Of course he did not get it by having an easy life...his strength came through a journey from a challenge, then through pain, growth and victory. I am not sure how many cubs his has in the area, but you can bet the heart of this bear beats on in many of them and his legend will never die. Mountain Girl, Paula, logging out. 1900 Bridge rail lives on? John Schilken emailed me these pictures.The first two he took up at Bradley Wales on West Rim. You can see a rail that suspiciously looks like the rail on this old Leetonia Bridge. The last picture was taken off of a glass negatives, which were only around from 1880 to the 1920's. 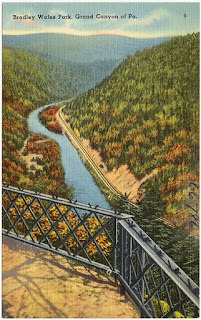 The bridge seems much longer than it does today unless since it is so narrow is an illusion. You will have to click on picture and make it large to see the metal rail clearly. Also notice the points of the rail in original were not bend over as they are above. This is looking into town from the South point first bridge. 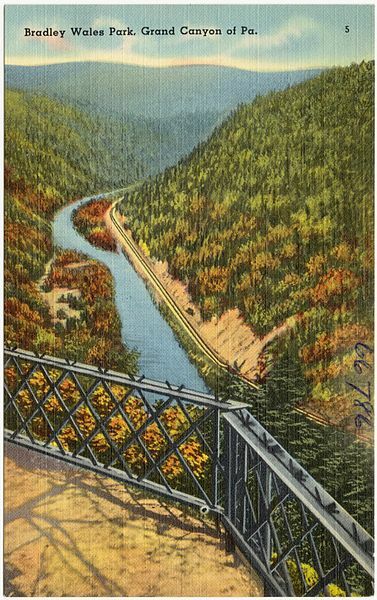 Leetonia hotel is on the left and Zimmerman's camp is on the right.After first posting this I found a color postcard with the railing on it by 1930. 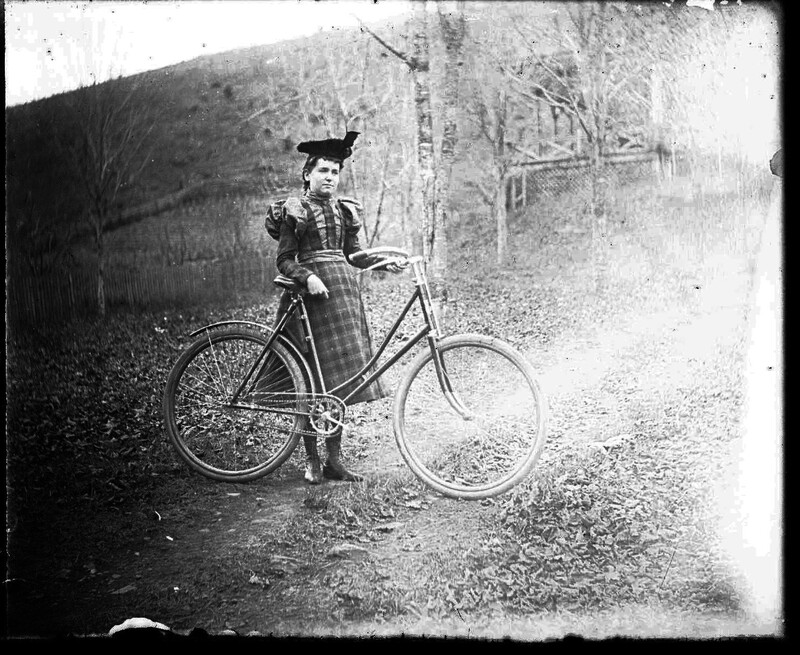 This picture of a woman with a bicycle was also part of the group of pictures and based on looking up clothes style and the popularity of riding bikes for woman it looks like 1900. John thinks this has to be Mrs. Lee cause the poor workers in the mill would not have been able to afford such a luxury as a bicycle or nice clothes. If any of you know if the rail from this 1900 bridge was used at Bradley Wales let me know. I will post some of the other pictures from glass negatives later. Mountain girl, Paula, logging out. As a kid I remember walking up to Lee Firetower and climbing up to see the ranger. The tower swayed back and forth in the wind and it was an unsettling experience and at the same time exhilarating to see the entire forest. Some time in the late 80's the firetower was taken down. Satellites replaced the eyes of the ranger and something was lost. I wished that I could have re-erected it on the top of my hill a bit lower view for it but it would have been wonderful. I have even looked at other firetowers for sale, but the cost of moving and re-erecting them is out of my budget. I would imagine keeping people from climbing it and the insurance, and maintenance would also be costly. Of course in my child mind none of that mattered...just seeing it again would be great. A friend who writes another blog reminded me of the Lee Firetower with her recent post about the Cherry Springs Tower, which is still there. Here is a link to her blog. The firetower originally costs only $621 dollars to erect. Now even for an old one it would be in the 10's of thousands. 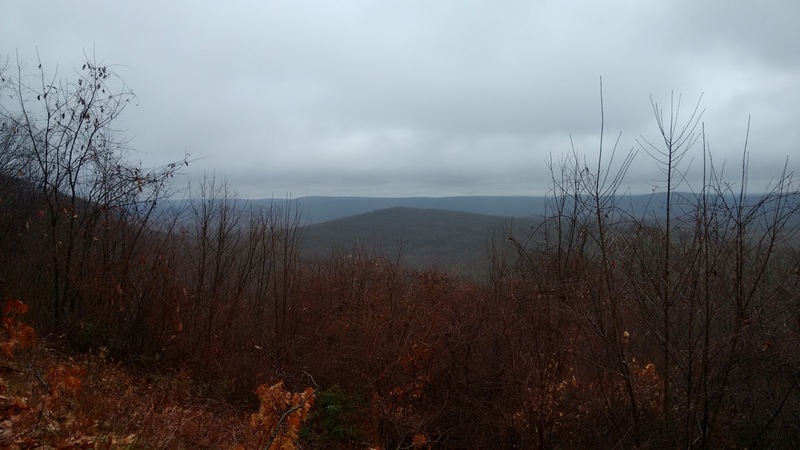 A salute to the Lee Firetower. Mountain girl, Paula, Logging out.